Like the northern lights, eclipses have been viewed since ancient times, often with a mixture of fear and awe. The Sun is such an important part of life. It has featured in mythology and worship for millennia, also forming the stimulation for much of the early astronomy. The Vedic religion, the precursor to modern Hinduism, has one of the earliest written texts dating back to 1500 BCE. It contains hymns praising the Sun as the source and sustainer of all earthly life. Part of the Vedas was devoted to astronomy and was already an influential work by the fourth century BCE, possibly feeding into Greek astronomy. Many of the Christian Church’s holy days are rooted in solar festivities – Christmas at the winter solstice, Easter at the vernal equinox. Nowhere is its influence more intensely felt than at the polar regions, both day and night, in light and in darkness. I have felt its power. Squinting into the sunshine for the first time in almost 3 weeks! 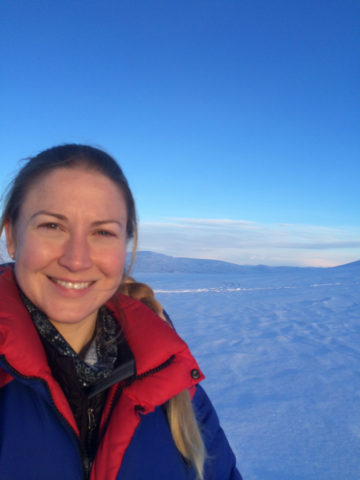 Svalbard, March 2015. 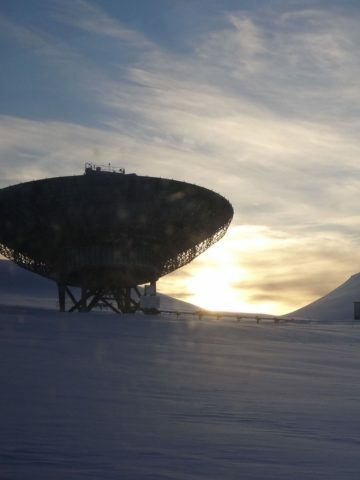 One of the EISCAT radars on Svalbard with the Sun behind, shining on the mountain. This picture is me squinting into the Sun for the first time in almost 3 weeks. I was so excited to see the Sun again!! I was in Svalbard in the twilight period as they were coming out of polar night. The Sun had not yet risen above the horizon, so although there was some daylight, we didn’t see the Sun. It took weeks to rise high enough to be seen in town. On this day I was visiting these EISCAT radars and the KHO auroral observatory, which are out of town up a mountain. Being that little bit higher up meant that we were suddenly in the Sun – and it felt terrific! It is very weird to be without Sun for weeks at a time. We all have a connection to the Sun. And our planet has a connection to the Sun too. Nothing shows this connection more beautifully than the aurora. When you look up at a total eclipse you see the solar corona – the wispy atmosphere of the Sun streaming off into space as the solar wind. This solar wind then drives the acceleration of charged particles into our atmosphere to cause the aurora. We all have a connection to the sky. 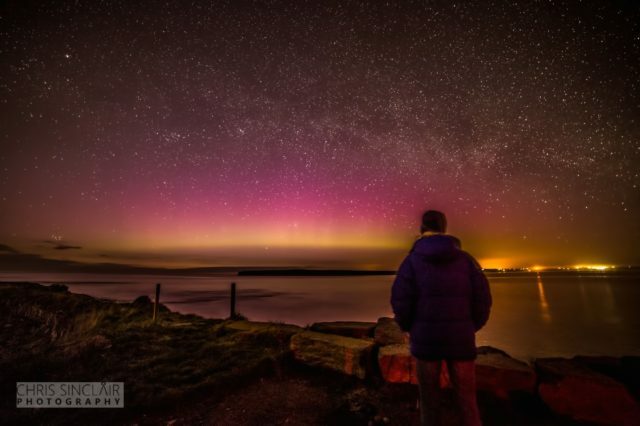 Me looking for aurora in Caithness, Scotland, by Chris Sinclair. The aurora really is our connection to the Sun. It’s the way our little planet protects itself from the battering of the solar wind – absorbing all that energy in its magnetic field and dissipating it as an incredibly beautiful light show. So when you’re watching an eclipse, bathed in the beauty of a new, ethereal light, think also of the glorious effect those wispy streaming tendrils can have on Earth. 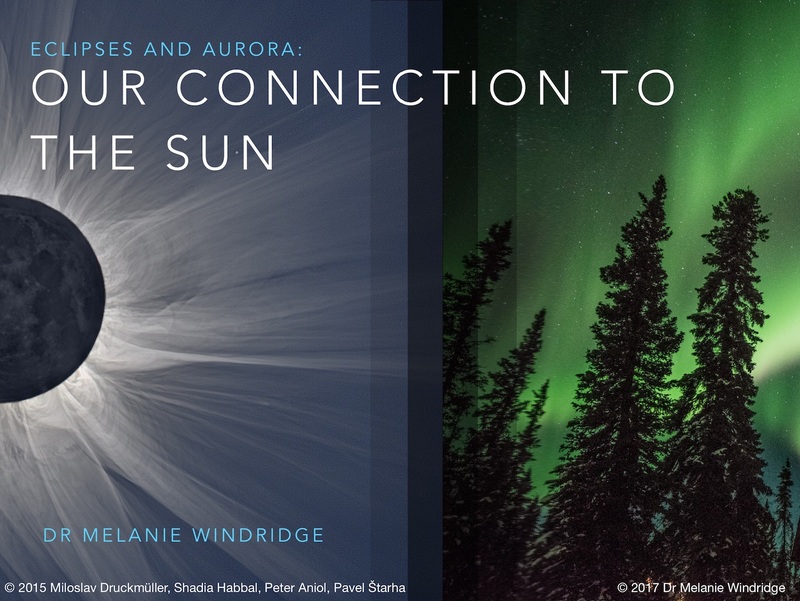 If you’re in Oregon, come and see me talk about Eclipses & Aurora: our Connection to the Sun at Eola Hills on Sunday 20th August 2017. 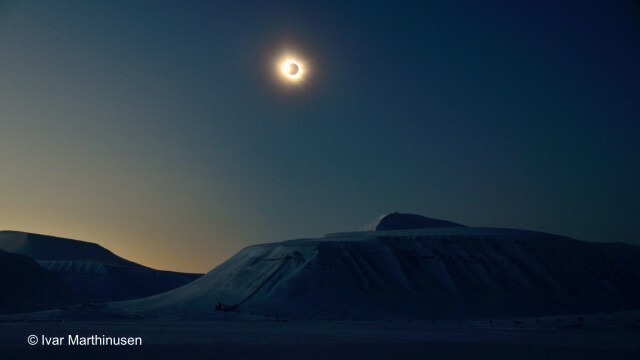 Totality on 20th March 2015, Spitsbergen, Svalbard, by Ivar Marthinusen.